We may be edging towards autumn, but the Summer Triangle, the asterism formed by the bright stars Vega, Altair and Deneb, looms high in the south as night falls and shifts into the high south-west by our star map times later in the evening. Vega, almost overhead as the night begins, is the brightest of the three and lies in the small box-shaped constellation of Lyra the Lyre. The next brightest, Altair in Aquila the Eagle, stands lower in the middle of our southern sky and, at 16.7 light years (ly), is one of the nearest bright stars to the Sun – eight light years closer than Vega. Flanking Altair, like the two sides of a balance, are the fainter stars Alshain (below Altair) and Tarazed (above) whose names come from “shahin-i tarazu”, the Arabic phrase for a balance. Deneb, 25° from Vega, lies very high in the south-east at nightfall and overhead at our map times. It marks the tail of Cygnus the Swan which is flying overhead with wings outstretched and its long neck reaching south-westwards to Albireo, traditionally the swan’s beak. Although it is the dimmest corner-star of the Triangle, Deneb is one of the most luminous stars in our galaxy. Current estimates suggest that it shines some 200,000 time more brightly than our Sun from a distance of perhaps 2,600 ly, but its power and distance are hard to measure and the subject of some controversy. Also controversial is the nature of Albireo. Even small telescopes show it as a beautiful double star in which a brighter golden star contrasts with a dimmer blue one. The mystery concerns whether the pair make up a real binary, with the two stars locked in orbit together by gravity, or whether this is just the chance alignment of two stars at different distances. Now measurement by the European Space Agency’s Gaia spacecraft appear to confirm the chance alignment theory. The Milky Way, the band of countless distant stars in the plane of our galaxy, flows through the Summer Triangle and close to Deneb as it arches across our evening sky. 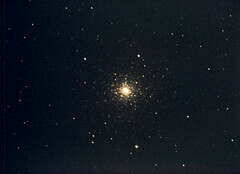 Scan it through binoculars to glimpse a scattering of other double stars and star clusters. One interesting stellar group is the so-called Coathanger which lies 8°, a little more than a normal binocular field-of-view, south of Albireo. It is also easy to locate one third of the way from Altair to Vega. Its line of stars, with a hook of stars beneath, gives it the appearance of an upside-down coat hanger. 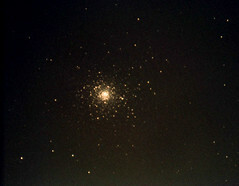 For decades this was regarded as a true star cluster, whose stars formed together, and its alternative designations as Brocchi’s Cluster and Collinder 399 reflect this. 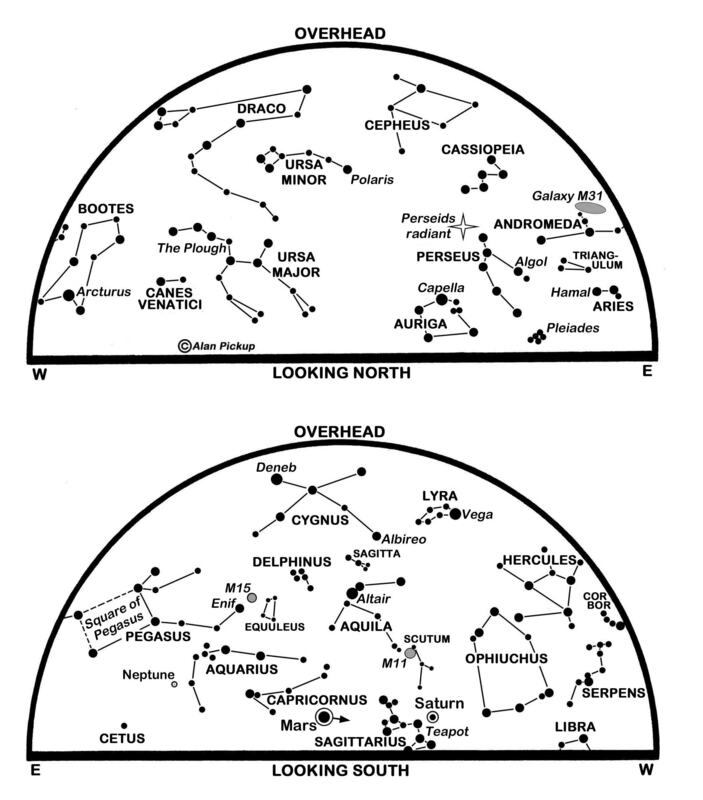 In 1998, though, results from the Hipparcos satellite, Gaia’s predecessor, proved that the Coathanger’s stars are at very different distances so that it, like Albireo, is simply a fortuitous chance alignment. The Sun sinks 11.5° southwards during September to cross the sky’s equator at 02:54 BST on the 23rd. This marks our autumnal equinox and, by one definition, the beginning of autumn in the northern hemisphere. Sunrise/sunset times for Edinburgh change from 06:17/20:07 BST on the 1st at 07:13/18:51 on the 30th. The Moon is at last quarter on the 3rd, new on the 9th, at first quarter on the 17th and full on the 25th. Venus is brilliant at magnitude -4.4 and 45° from the Sun on the 1st but it is only 4° above Edinburgh’s west-south-western horizon at sunset and sets 35 minutes later as its evening apparition as seen from Scotland comes to an end. The other inner planet, Mercury, is prominent but low in the east-north-east before dawn until about the 14th. Glimpse it at magnitude -1.1 when it lies 1° above-left of Regulus in Leo on the 6th and 9° below-left of the impressively earthlit waning Moon on the 8th. Jupiter is conspicuous but very low in the south-west at nightfall, sinking to set in the west-south-west one hour before our map times. Look for it below-right of the Moon on the 13th. Saturn and Mars are in the far south of our evening sky. Saturn, the fainter of the two at magnitude 0.4 to 0.5, stands above the Teapot of Sagittarius and is just below and right of the Moon on the 17th when a telescope shows that its rings span 38 arcseconds around its 17 arcseconds disk. It sets in the south-west some 70 minutes after our map times. Mars stands more than 25° east (left) of Saturn, tracks 7° eastwards and northwards in Capricornus and stands near the Moon on the 19th and 20th. It is easily the brightest object (bar the Moon) in the sky at our map times though it more than halves in brightness from magnitude -2.1 to -1.3. As its distance increases from 67 million to 89 million km, its ochre disk shrinks from 21 to 16 arcseconds. The dust storm that blanketed the planet since June has now died down. Finally, we have a chance to spot the Comet Giacobini-Zinner as it tracks south-eastwards past the bright star Capella in Auriga, low in the north-east at our map times but high in the east before dawn. The comet takes only 6.6 years to orbit the Sun and should appear in binoculars as a small oval greenish smudge only 0.9° to the right of Capella on the evening of the 2nd when it is 60 million km away. Moving at almost 2° per day, it passes less than 7° north-east of Elnath in Taurus (see chart) on the morning of the 11th, just a day after it reaches perihelion, its closest (152 million km) to the Sun. This is a slightly revised version, with added diary, of Alan’s article published in The Scotsman on August 31st 2018, with thanks to the newspaper for permission to republish here. The persistent twilight that has swamped Scotland’s night sky since May is subsiding in time for us to appreciate four bright evening planets and arguably the best meteor shower of the year. The Perseid shower returns every year between 23 July and 20 August as the Earth cuts through the stream of meteoroids that orbit the Sun along the path of Comet Swift-Tuttle. As they rush into the Earth’s atmosphere at 59 km per second, they disintegrate in a swift streak of light with the brighter ones often laying down a glowing train that may take a couple of seconds or more to dissipate. 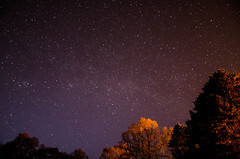 The shower is due to peak in the early hours of the 13th at around 02:00 BST with rates in excess of 80 meteors per hour for an observer under ideal conditions – under a moonless dark sky with the shower’s radiant point, the place from which the meteors appear to diverge, directly overhead. We should lower our expectations, however, for although moonlight is not a problem this year, most of us contend with light pollution and the radiant does not stand overhead. Even so, observable rates of 20-40 per hour make for an impressive display and, unlike for the rival Geminid shower in December, we don’t have to freeze for the privilege. Indeed, some people enjoy group meteor parties, with would-be observers reclining to observe different parts of the sky and calling out “meteor!” each time they spot one. Target the night of 12th-13th for any party, though rates may still be respectable between the 9th and 15th. 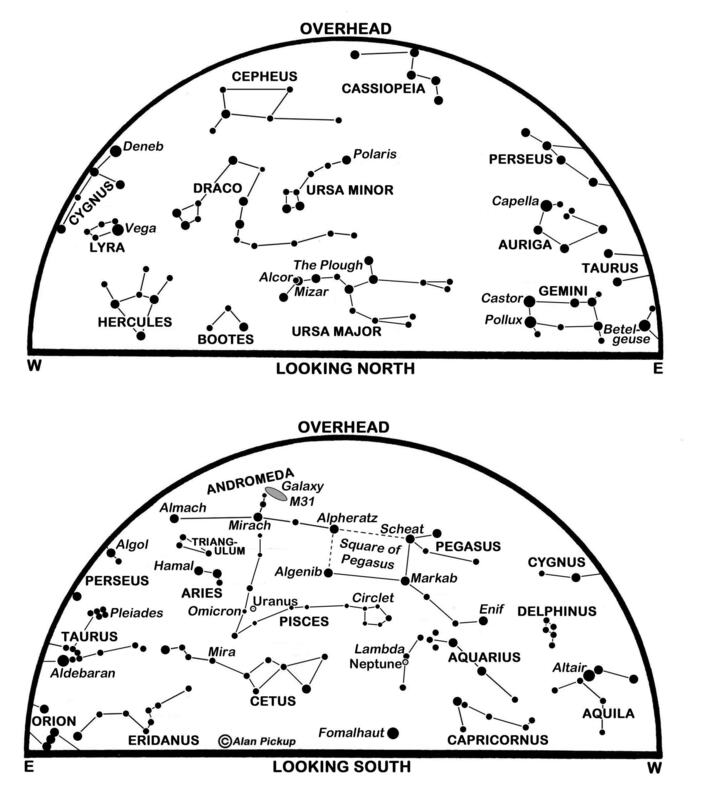 The shower takes its name from the fact that its radiant point lies in the northern part of the constellation Perseus, see the north map, and climbs from about 30° high in the north-north-east as darkness falls to very high in the east before dawn. Note that Perseids fly in all parts of the sky – it is just their paths that point back to the radiant. Records of the shower date back to China in AD 36 and it is sometimes called the Tears of St Lawrence after the saint who was martyred on 10 August AD 258, though it seems this title only dates from the nineteenth century. Sunrise/sunset times for Edinburgh change this month from 05:17/21:20 BST on the 1st to 06:15/20:10 on the 31st. The Moon is at last quarter on the 4th, new on the 11th, at first quarter on the 18th and full on the 26th. A partial solar eclipse on the 11th is visible from the Arctic, Greenland, Scandinavia and north-eastern Asia. Observers in Scotland north of a line from North Uist to the Cromarty Firth see a thin sliver of the Sun hidden for just a few minutes at about 09:45 BST. Our best place to be is Shetland but even in Lerwick the eclipse lasts for only 43 minutes with less than 2% of the Sun’s disk hidden at 09:50. To prevent serious eye damage, never look directly at the Sun. Vega in Lyra is the brightest star overhead at nightfall and marks the upper right corner of the Summer Triangle it forms with Deneb in Cygnus and Altair in Aquila. Now that the worst of the summer twilight is behind us, we have a chance to glimpse the Milky Way as it flows through the Triangle on its way from Sagittarius in the south to Auriga and the star Capella low in the north. Other stars of note include Arcturus in Bootes, the brightest star in our summer sky, which is sinking in the west at the map times as the Square of Pegasus climbs in the east. Of the quartet of planets in our evening sky, two have already set by our map times. The first and brightest of these is Venus which stands only 9° high in the west at Edinburgh’s sunset on the 1st and sets itself 68 minutes later. By the 31st, these numbers change to 4° and 35 minutes, so despite its brilliance at magnitude -4.2 to -4.4, it is becoming increasingly difficult to spot as an evening star. It is furthest east of the Sun (46°) on the 17th. Jupiter remains conspicuous about 10° high in the south-west as darkness falls and sets in the west-south-west just before the map times. Edging eastwards in Libra, it dims slightly from magnitude -2.1 to -1.9 and slips 0.6° north of the double star Zubenelgenubi on the 15th. A telescope shows it to be 36 arcseconds wide when it lies below-right of the Moon on the 17th. The two planets low in the south at our map times are Mars, hanging like a prominent orange beacon only some 7° high in south-western Capricornus, and Saturn which is a shade higher above the Teapot of Sagittarius almost 30° to Mars’ right. Mars stood at opposition on 27 July and is at its closest to the Earth (57.6 million km) four days later. A planet-wide dust storm has hidden much of the surface detail on its small disk which shrinks during August from 24 to 21 arcseconds as its distance increases to 67 million km. Although Mars dims from magnitude -2.8 to -2.1, so it remains second only to Venus in brilliance. Catch the Moon near Saturn on the 20th and 21st and above Mars on the 24th. Finally, we cannot overlook Mercury which is a morning star later in the period. Between the 22nd and 31st, it brightens from magnitude 0.8 to -0.7, rises more than 90 minutes before the Sun and stands around 7° high in the east-north-east forty minutes before sunrise. It is furthest west of the Sun (18°) on the 26th. This is a slightly revised version, with added diary, of Alan’s article published in The Scotsman on July 31st 2018, with thanks to the newspaper for permission to republish here. Comets have always been of particular interest. Appearing without warning, and sometimes with impressive tails, it was not surprising that they were regarded as portents of battles to be won or lost and of the passing of kings. It was in 1705 that Edmond Halley first published the orbit of the comet that now bears his name. This, and the more than 5,000 comets that have been studied since, have all proved to be members of our solar system. Some, like Halley, follow closed elongated orbits, returning to perihelion in the Sun’s vicinity every few years. Many more, though, trace almost parabolic paths as they dive towards the Sun from the Oort cloud, a spherical reservoir of icy worlds at the edge of the Sun’s influence – if they ever return to perihelion it may not be for millions of years. A handful, though, receive a sufficient gravitational boost as they pass a planet that they are flung beyond the Oort cloud into interstellar space, never to return. Now astronomers have sighted a faint object which appears to have originated far beyond the Oort cloud, perhaps as an escapee from another star. Discovered by the Pan-STARRS 1 telescope in Hawaii on 18 October, it had already reached its perihelion within 38 million km of the Sun nine days before and passed 24 million km from the Earth on the 14th. Dubbed at first Comet/2017 U1 (PanSTARRS) because of its highly eccentric comet-like orbit, its name was changed to A/2017 U1 on 25 October when observers failed to detect any trace of a tail or hazy coma surrounding its small nucleus, probably less than 200 metres wide. So, for the moment, it is classed as an asteroid. Its path though is certainly hyperbolic, having entered the solar system at a relative speed of 26 km per second from a direction close to the bright star Vega in the constellation Lyra. This is also close to the direction that our solar system is moving at 20 km per second with regard to the stars around us, so it may be expected that interstellar intruders, be they comets or asteroids, are most likely to appear from this region. As our first known visitor from interstellar space, frantic efforts are underway to investigate its spectrum and nature before it recedes forever from view in the direction of the Square of Pegasus. Our sole bright evening planet, Saturn at magnitude 0.5, is easy to miss as it hangs low in the south-west at nightfall, sinking to Edinburgh’s horizon at 18:40 on the 1st and by 16:58 on the 30th. We may need binoculars to spy it in the twilight 5° left of the young earthlit Moon on the 20th and 8° below-right of the Moon a day later. Mercury stands 22° east of the Sun on the 24th but is unlikely to be visible from our latitudes. The other naked-eye planets are all in our predawn sky. Mars rises in the east just before 04:00 throughout November, climbing to stand 15° to 20° high in the south-east before its magnitude 1.8 pinprick is swallowed by the twilight. 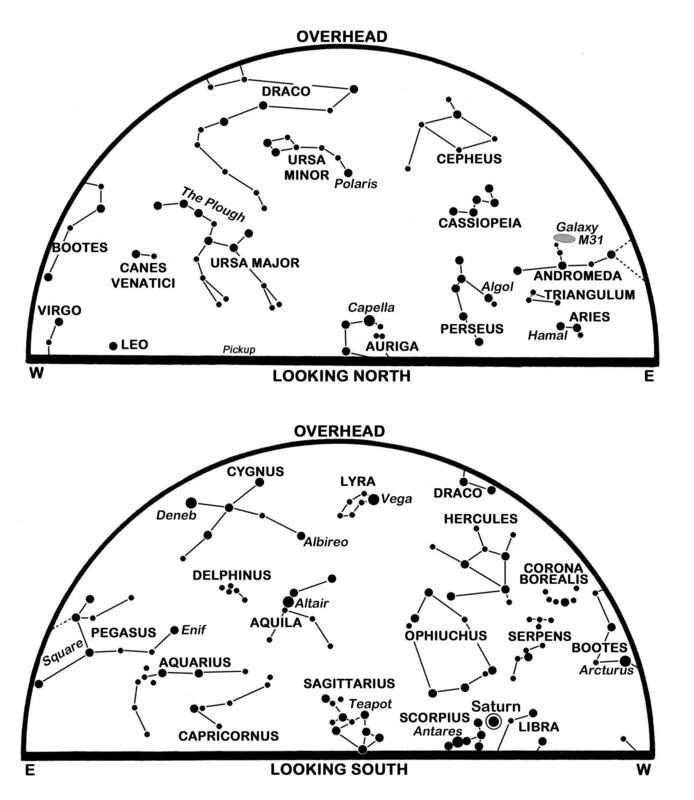 This month, it tracks 19° east-south-eastwards in Virgo to pass 3° north of Virgo’s leading star Spica on the 28th. Mars stands to the right of the waning Moon on the 15th when a telescope show it as only 4 arcseconds wide – too small to see any detail. Venus continues as a brilliant morning star of magnitude -3.9, but it stands lower each morning as it approaches the Sun’s far side. Currently above and left of Spica but speeding east-south-eastwards into Libra, it rises a little more than two hours before the Sun on the 1st and one hour before sunrise by the 30th. Jupiter, about to emerge from the Sun’s glare below-left of Venus, climbs to pass a mere 16 arcminutes, or half the Moon’s diameter, below-right of Venus on the 13th. Conspicuous at magnitude -1.7, the Jovian disk appears 31 arcseconds wide as compared with only 10 arcseconds for Venus. On the 17th, the incredibly slim earthlit Moon lies above-left of Venus and to the left of Jupiter while the later stands 18° above-right of Venus by the 30th. Sunrise/sunset times for Edinburgh change from 07:20/16:32 on the 1st to 08:18/15:45 on the 30th. The Moon is full on the 4th, at last quarter on the 10th, new on the 18th and at first quarter on the 26. The annual Leonids meteor shower lasts from the 15th to the 20th and peaks on the night of the 17th-18th. Its meteors, all of them very fast and many leaving glowing trains in their wake, emanate from the Sickle, the reversed question-mark of stars above Regulus in Leo. This rises in the north-east at 22:00, with most Leonids visible during the predawn hours as it climbs through our eastern sky. The shower has given some spectacular meteor storms in the past, notably in 1966 and 1999, but the parent comet, Comet Tempel-Tuttle, is now near the farthest point of its orbit and rates may be around a dozen meteors per hour. For once, though, moonlight is no hindrance. This is a slightly revised version of Alan’s article published in The Scotsman on October 31st 2017, with thanks to the newspaper for permission to republish here. The Sun’s southerly motion since the solstice on 21 June has yet to gain speed and not until 12 July does it lie sufficiently far south for Edinburgh to enjoy any so-called nautical darkness, with the Sun more than 12° below the northern horizon in the middle of the night. Even then, moonlight is troublesome for a few more days to delay our first views of a dark summer night sky. If there is one star-pattern that dominates our skies over the summer, it is the Summer Triangle. Formed by the bright stars Vega in the constellation Lyra, Deneb in Cygnus and Altair in Aquila, it occupies the upper part of our south star map, though its outline is not depicted. In fact, the projection used means that the Triangle’s proportions are squashed, because Vega and Deneb are significantly closer together in the sky than either are to Altair. The leader and brightest of the Triangle’s stars is Vega which moves from high in the east at nightfall to stand even higher in the south at our map times. Blazing at magnitude 0.0 from a distance of 25 light years, it is a white star, twice as massive as our Sun but very much younger. Excess heat revealed by infrared astronomy indicates that Vega is encircled by a disk of dust which may be evidence that a planetary system is forming around it. Altair is the second brightest of the Triangle’s stars and one of the closest bright stars at “only” 16.7 light years. Shining at magnitude 0.8, half as bright as Vega, it is 80% more massive than our Sun but, remarkably, spins on its axis in about nine hours as compared with the more leisurely 25 days taken by the Sun. As a result, it is noticeably oblate, measuring 20% wider across its equator than it does pole-to-pole. Deneb’s magnitude of 1.2 makes it the dimmest of the Triangle’s corner stars but it is also one of the most luminous stars in our Milky Way Galaxy. Because its distance may be around 2,600 light years, it very difficult to measure the minuscule shift in its position when viewed from opposite sides of the Earth’s orbit around the Sun – the parallax technique that gives us accurate distances to Vega and Altair. Indeed, estimates of Deneb’s distance differ by well over 1,000 light years. White-hot and shining at some 200,000 Sun-power, Deneb is large enough to engulf the Earth were it to swap places with the Sun. It is also burning its nuclear fuel at such a rate that it seems destined to disintegrate in a supernova within a few million years, although it should survive to be another of our future pole stars as it comes as close as 5° to the pole in AD 9,800. The Sun eventually tracks 5° southwards during July as Edinburgh’s sunrise/sunset times change from 04:32/22:01 BST on the 1st to 05:15/21:22 on the 31st. The Moon is at first quarter on the 1st, full on the 9th, at last quarter on the 16th, new on the 23rd and returns to first quarter on the 30th. At magnitude -2.0, Jupiter remains our brightest evening planet though it stands lower in the south-west to west as it sinks to set in the west just before our star map times. Above and to the right of the star Spica in Virgo, it lies to the right of the Moon in the south-west as the sky darkens on the 1st and is just below the Moon and much lower in the west-south-west on the 28th. The cloud-banded Jovian disk appear 39 arcseconds wide at mid-month if viewed telescopically, while binoculars allow glimpses of its four main moons. Saturn is less conspicuous at magnitude 0.1 to 0.3 but continues as the brightest object low in our southern night sky. 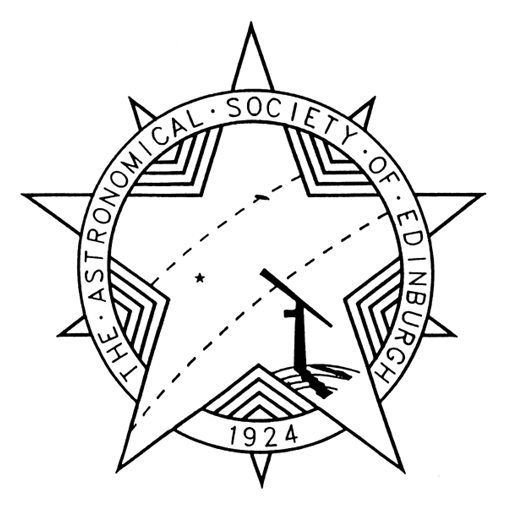 Creeping westwards against the stars of southern Ophiuchus, it crosses Edinburgh’s meridian at an altitude of 12° one hour before our map times and may be spotted 3° below-left of the Moon on the 6th. Binoculars show it as more than a round dot, while small telescopes reveal the beauty of ring system which is tilted wide open to our view and spans 41 arcseconds in mid-July. Venus is brilliant at magnitude -4.1 in the east before dawn. After rising in the north-east at about 02:15 BST throughout the month. it climbs to stand 17° high at sunrise as the month begins and higher still by its end. Seen through a telescope, it is 16 arcseconds across and 70% illuminated when it lies to the left of waning (15% sunlit) and earthlit Moon on the 20th. Against the background stars of Taurus, the planet moves from 8° below-right of the Pleiades tomorrow to pass 3° above-left of Aldebaran on the 14th. Of the other bright planets, Mars is out of sight as it reaches conjunction on the Sun’s far side on the 27th, while Mercury stands furthest east of the Sun (27°) on the 30th but is unlikely to be seen near our west-north-western horizon in the bright evening twilight. This is a slightly-revised version of Alan’s article published in The Scotsman on June 30th 2017, with thanks to the newspaper for permission to republish here. Venus dominated our evening sky for the first quarter of 2017, but it is now Jupiter’s turn in the spotlight. The conspicuous giant planet lies directly opposite the Sun in the sky on the 7th so that it rises in the east at sunset, reaches its highest point in the south in the middle of the night and sets in the west at sunrise. 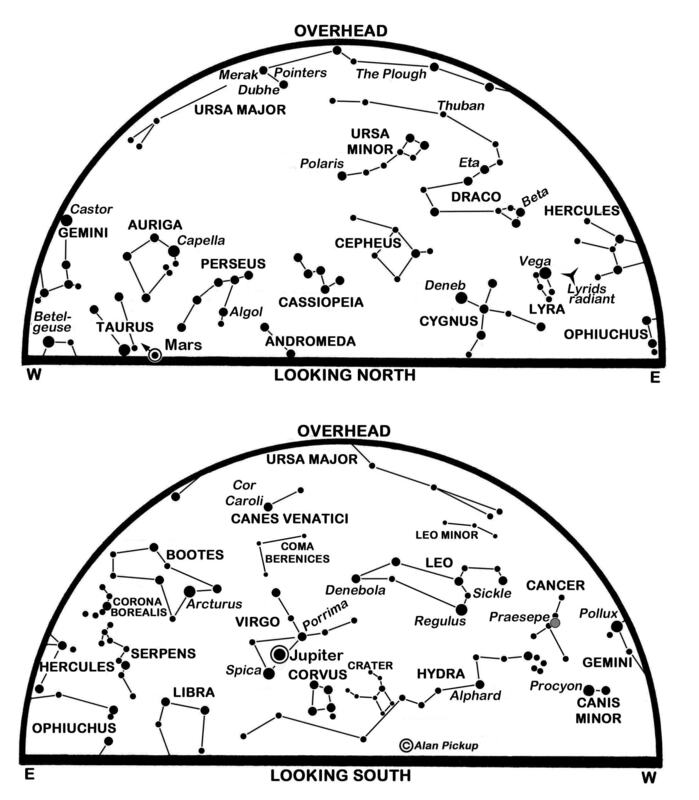 Our charts show it in Virgo to the east of south as Taurus and Orion dip beneath the western horizon and the Plough looms overhead, stretched out of its familiar shape by our map projection. Regulus in Leo is in the south-west and almost level with Arcturus in Bootes in the south-east. 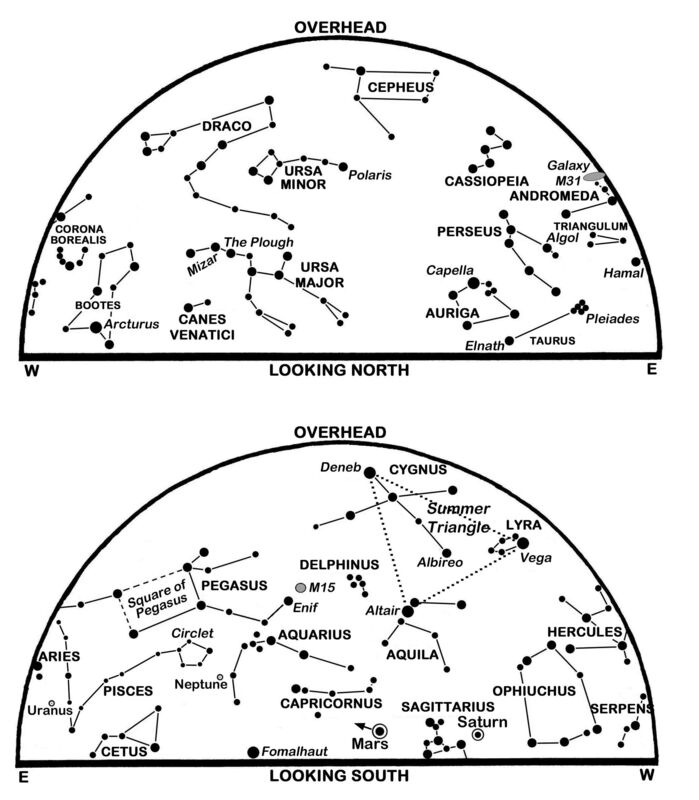 Vega in Lyra and Deneb in Cygnus are beginning their climb in the north-east. Sunrise/sunset times for Edinburgh change from 06:43/19:51 BST on the 1st to 05:31/20:50 on the 30th. The Moon is at first quarter on the 3rd, full on the 11th, at last quarter on the 19th and new on the 26th. Venus rises only a little more than one hour before sunrise and, though brilliant at magnitude -4.2, may be difficult to spot low in the east before dawn. However, the other inner planet, Mercury, remains nicely placed in the evening and stands furthest east of the Sun (19°) on the 1st. Thirty minutes after Edinburgh’s sunset on that day, Mercury is 12° high in the west and shines at magnitude 0.0. It should be possible to spy it through binoculars and eventually with the unaided eye as the twilight fades and the planet sinks to set another 96 minutes later. By the 8th, though, it is a couple of degrees lower and a quarter as bright at magnitude 1.6 as it is engulfed by the twilight. Inferior conjunction on the Sun’s near side occurs on the 20th. Mars, magnitude 1.5 to 1.6 and above and to Mercury’s left at present, tracks east-north-eastwards this month to pass 5° below the Pleiades on the 15th and a similar distance left of the star cluster on the 26th. By then it sets late enough to be plotted near our north-western horizon at the star map times. Its opposition means that Jupiter is at its brightest and closest, shining more brightly than any star at magnitude -2.5 and a distance of 666 million km. It lies 6° north-west (above-right) of Virgo’s leading star Spica as the month begins and tracks 3.7° westwards during April to pass 10 arcminutes or a third of a Moon’s-width south of the fourth magnitude star Theta Virginis on the 5th. Jupiter lies close to the full Moon on the night of the 10th-11th when the Jovian disk appears 44 arcseconds wide if viewed telescopically, one fortieth as wide as the Moon. Jupiter’s clouds are arrayed in bands that lie parallel to its equator, the dark ones called belts and the intervening lighter hued ones called zones. There are numerous whirls and spots, the most famous being the Great Red Spot in the southern hemisphere. The planet spins in under ten hours, so a resolute observer might view the entire span of its clouds in a single April night. The four main moons, visible through decent binoculars and easy through a telescope, lie on each side of the disk and change their configuration from night to night. The beautiful planet Saturn rises in the south-east less than three hours after our map times and is the brightest object (magnitude 0.4 to 0.3) less than 15° above Edinburgh’s southern horizon before dawn. It is a shame that its low altitude means that we miss the sharpest and most impressive views of it rings which span 39 arcseconds in mid-April, and are tilted at 26° around its 17 arcseconds disk. After appearing stationary on the 6th, Saturn begins to creep westwards against the stars of Sagittarius – look for it below and left of the Moon on the 16th and right of the Moon on the 17th. It is not often that I advertise the annual Lyrids meteor shower. As one of the year’s lesser displays, it yields only some 18 meteors per hour at best, all of them swift and some leaving glowing trains in their wake as they diverge from a radiant point to the right of Vega. The event lasts from the 18th to the 25th and peaks on the 22nd when moonlight should not interfere unduly this year. The Lyrid meteoroids were released by Comet Thatcher, last seen in 1861. Bright comets have been rare of late, but fainter ones are observed frequently. One such has the jaunty name of comet 41P/Tuttle–Giacobini–Kresák and takes 5.4 years to orbit between the paths of Jupiter and the Earth. It passes within 21 million km of us on the 1st as it nears perihelion, its closest point to the Sun, on the 12th. I glimpsed it through binoculars from a superb dark-sky site at Kielder Forrest, Northumberland, last week when it was a diffuse seventh magnitude smudge close to Merak, the southern star of the Pointers in the Plough. Although its path is not depicted on our chart, the comet is poised to sweep close to three of the stars identified in Draco, between the Plough and Polaris, the Pole Star. It passes 0.6° north of Thuban on the night of the 2nd-3rd, 1.5° south-west of Eta on the 11th (sadly, in full moonlight) and 0.6° west of Beta on the 18th-19th. During past perihelia, it has been seen to flare by several magnitudes for a few days at a time, so, if we are lucky, it may reach naked-eye visibility. This is a slightly-revised version of Alan’s article published in The Scotsman on March 31st 2017, with thanks to the newspaper for permission to republish here. Since our nights are still awash with summer twilight, we may be excused if our attention this month turns to Pluto as it is visited by a spacecraft for the first time. Pluto was still regarded as a the solar system’s ninth planet when NASA’s New Horizons mission launched in 2006, but it was officially reclassified as a dwarf planet later that year. We now recognise it as one of several icy worlds, and not even the largest, in the Kuiper Belt of such objects beyond the orbit of Neptune. Pluto is 2,368 km wide and has a system of five moons, two of them only discovered while New Horizons has been en route. The largest moon, Charon, is 1,207 km across and, like Pluto itself, will block the probe’s signal briefly as New Horizons zooms through the system at a relative speed of almost 14 km per second on the 14th. The closest approach to Pluto is due at 12:50 BST at a range of some 12,500 km from Pluto and 4,772 million km from the Earth. It will not hang around, though, since this is a flyby mission and the probe will speed onwards, perhaps to encounter another still-to-be-identified Kuiper Belt world before the end of this decade. A conjunction of an altogether different type is gracing our western evening sky as July begins. The two most conspicuous planets have been converging over recent weeks and stand at their closest on the 1st when the brilliant Venus passes within 21 arcminutes, or two-thirds of a Moon’s breadth, of Jupiter. On that evening, Venus is just below and left of Jupiter and sinks from 14° high in the west at sunset to set in the west-north-west about 100 minutes later. Shining at magnitude -4.4 from a distance of 76 million km, Venus appears 33 arcseconds in diameter and 33% illuminated, its dazzling crescent visible through a small telescope or even binoculars. Jupiter, 911 million km away on that evening, is 32 arcseconds wide but only one eleventh as bright at magnitude -1.8. Over the coming days, Venus slips to the left with respect to Jupiter as both planets drop lower into the twilight. By July 15, Venus is only 7° high at sunset and sets within the hour, while Jupiter is 5° to its right and slightly higher, but unlikely to be seen without binoculars and a clear horizon. By then, too, Venus has closed to 61 million km and its crescent is taller but narrower, 41 arcseconds and 22% sunlit. It is perhaps surprising that the Earth reaches aphelion, the farthest point from the Sun in its annual orbit, on the 6th. We are then 152,093,481 km from the Sun, 4,997,277 km further away than we were at perihelion on January 4. Sunrise/sunset times for Edinburgh change from 04:31/22:01 BST on the 1st to 05:14/21:23 on the 31st. The Sun tracks 5° southwards during July to bring the return of nautical darkness for Edinburgh from the night July 11/12. By the last night of the month this official measure of darkness lasts for almost four hours. The Moon is full on the 2nd, at last quarter on the 8th, new on the 16th, at first quarter on the 24th and full again on the 31st – there is a notion, sadly mistaken, that a second full moon in a month should be termed a “blue moon”. The white star Vega climbs from high in the east at nightfall to dominate our high southern sky at the star map times. It stands at a distance of 25 light years, being the third brightest star ever seen in Scotland’s night sky after Sirius, which is currently out of sight, and Arcturus in Bootes which stands low in the west by the map times. Vega is twice as massive as our Sun and 40 times more luminous but only one tenth as old. It has an extensive disk of dusty material, although observations hinting that this contained a planet appear not to be supported my more recent studies. Vega is the leader of the small box-shaped constellation of Lyra the Lyre, representing a small harp from classical times. It is also the brightest star in the Summer Triangle that includes Deneb in Cygnus, high in the east at the map times, and Altair in Aquila, in the middle of our south-east. Far to the south of Vega is the so-called Teapot in Sagittarius which seems to be pouring to the right as it sits on Scotland’s southern horizon. We have much clearer views of this region of sky, rich in stars and star clusters, if we view them higher above the horizon under darker skies further south. The red supergiant Antares in Scorpius glowers to the right of the Teapot and lies 13° below-left of Saturn which is twice as bright at magnitude 0.3 to 0.4. Indeed, after the Moon, it is the brightest object low down in the south at nightfall, moving to the south-west by our map times and setting less than two hours later. Currently creeping westwards in eastern Libra, it shows an 18 arcseconds disk through a telescope, set within glorious rings that stretch across 41 arcseconds and have their north face inclined towards us at 24°. Catch the Moon to the right of Saturn on the 25th and to its left a day later. Of the other planets, Mars has yet to emerge from the Sun’s glare while Mercury hides low in our bright morning twilight as it moves towards superior conjunction on the Sun’s far side on the 23rd. This is a slightly-revised version of Alan’s article published in The Scotsman on June 30th 2015, with thanks to the newspaper for permission to republish here.